Hello! Welcome to the Day 2 of Taylored Expressions November Sneak Peeks! All products will be released on Thursday, November 6, @ 7 AM PST. 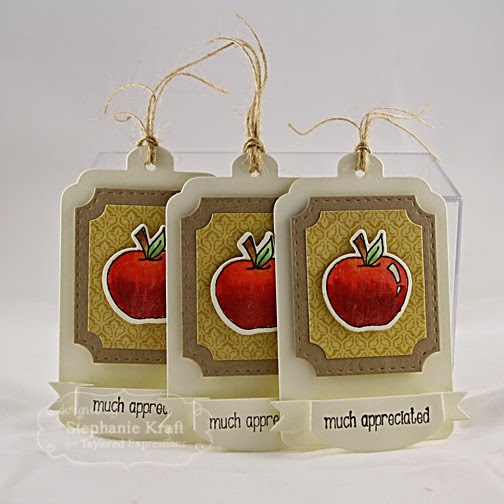 First up is a set of tags using Build a Tag 1, a fun & versatile tag builder die set. 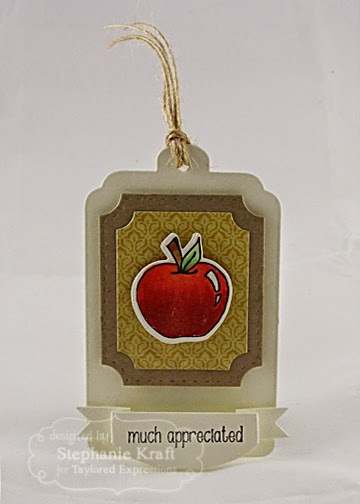 The apple and sentiment are from Tag-A-Long Autumn and the apple was die cut with the coordinating Tag-A-Long Autumn dies. Next is a card using more of the images from Tag-A-Long Autumn. Here I combined elements from Build a Tag 1 to fill the spaces in the Square Block Cutting Plate. 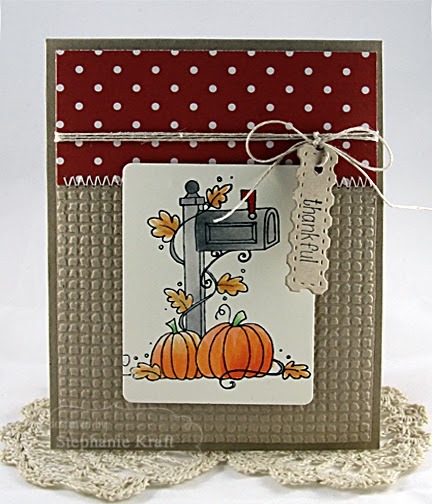 All images were die cut with the coordinating Tag-A-Long Autumn dies. You might also notice the embossing in the background. This is the new Burlap Embossing Folder. Love it! My final project is a card using the newest You've Got Mail - Fall stamp. Once again I used the Burlap Embossing folder. The tag is from Build a Tag 1 and sentiment is from Tag-A-Long Autumn. Accessories: Taylored Dies: Build a Tag 1, Tag-A-Long Autumn (TE); Markers (Copic), Burlap twine, Wink of Stella glitter brush pen, Foam tape, Thread, Sewing machine. 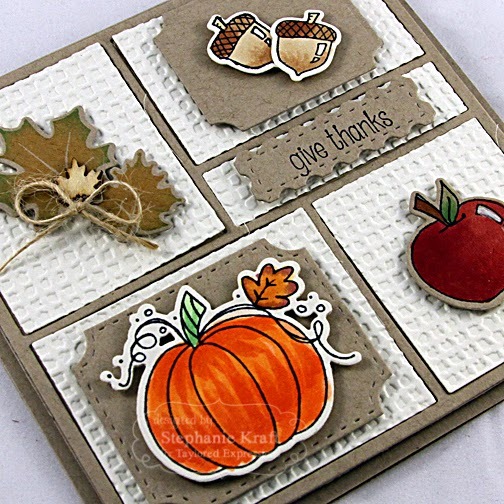 Accessories: Taylored Dies: Tag-A-Long Autumn, Square Block Cutting Plate, Burlap EF (TE); Corner rounder (Zutter), Markers (Copic), Wood veneer leaf (Studio Calico), Foam tape. Accessories: Taylored Dies: Build a Tag 1, Label Stacklets 6, Burlap EF (TE); Markers (Copic), Hemp cord, Wink of Stella glitter brush pen, Foam tape, Thread, Sewing machine. Fantastic tags and cards Steph. Love the Kraft base with the fall images. The burlap embossing looks great! Amazing projects! LOVE your give thanks card! Great projects! 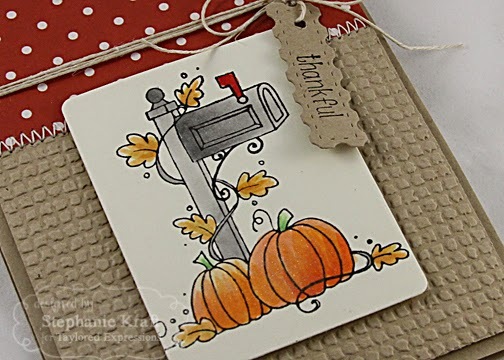 I love the tags, and the paper pieced card, and the mailbox card! Darling fall projects. Autum has the best colors. Great selection of colors on your projects. Wonderful work. You showcased the new products beautifully. Well done! Love the burlap embossing- so much texture and dimension. Great designs!